I will be posting some new trade ideas and past trades primarily using price-action and technical analysis. I personally like to sell option premium as a neutral strategy and play direction using futures and stocks. 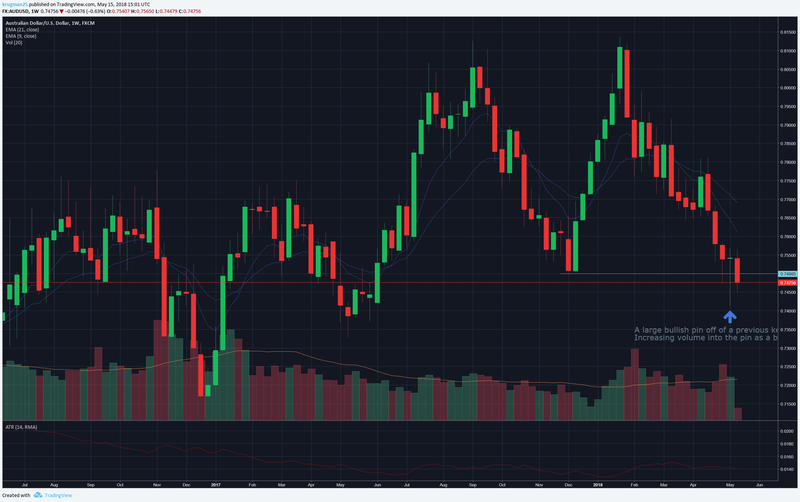 I will try and keep these posts centered around directional trades and things you might find in the futures, FX, and CFD markets. I may venture into stocks if there is a good setup. JP MORGAN CHASE & CO (NYSE:JPM). Get more trading ideas from krugman25. Follow market experts, get opinions and be heard! Join the largest trading & investing community on the planet. A large bullish pin off of a key support trend line signaled buyers ready to step in and defend price. Price took off shortly afterward. S&P 500 Index (SP:SPX). Get more trading ideas from krugman25. Follow market experts, get opinions and be heard! Join the largest trading & investing community on the planet. Here is a setup on the weeklies that I really like. It has quite a few good things going for it: a large bullish pin, increasing volume going into the pin, and its sitting on a key price level 0.75. Be aware of strong medium/short term selling into the pin. This qualifies as a reversal trade which are always more risky. Australian Dollar / U.S. Dollar (FX:AUDUSD). Get more trading ideas from krugman25. Follow market experts, get opinions and be heard! Join the largest trading & investing community on the planet. 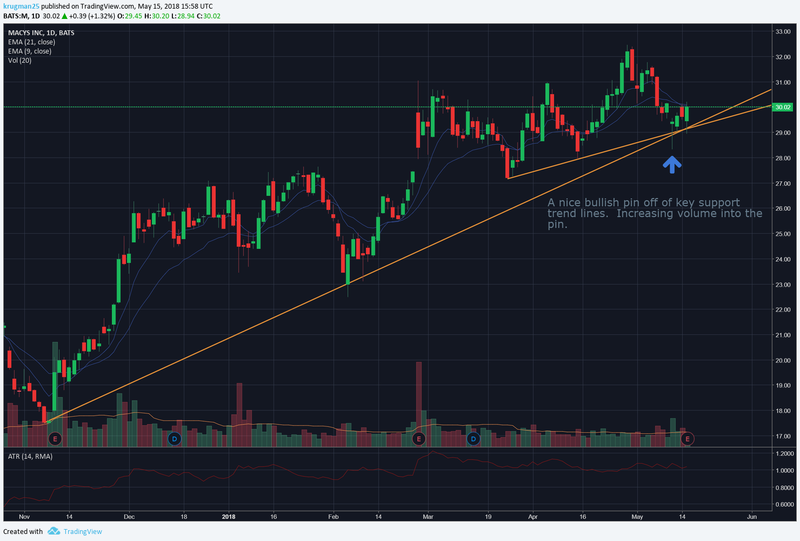 This is a nice setup on the daily chart where a large bullish pin candle formed off of a major trend line support and a minor trend line support. As an added bonus there was an increase of volume in the pin showing buying volume as buyers defended the price level. Earning are after market close so I expect increased volatility here. I’m currently long this trade through a short put options play. MACY'S INC (NYSE:M). Get more trading ideas from krugman25. Follow market experts, get opinions and be heard! Join the largest trading & investing community on the planet. Corn is in both a short and long term bullish trend . While the setup isn’t perfect, it does offer a compelling buy signal in a currently bullish market. The Morning Star formed off of a pullback and is in line with the overall bullish market strength. Corn (FOREXCOM:CORUSD). Get more trading ideas from krugman25. Follow market experts, get opinions and be heard! Join the largest trading & investing community on the planet. Good morning lady’s and gentle pips! It’s been an eventful last 24 hours for trading. My Macy’s (M) trade decided to go on an absolute bullish tear this morning and is up 9% pre-market. 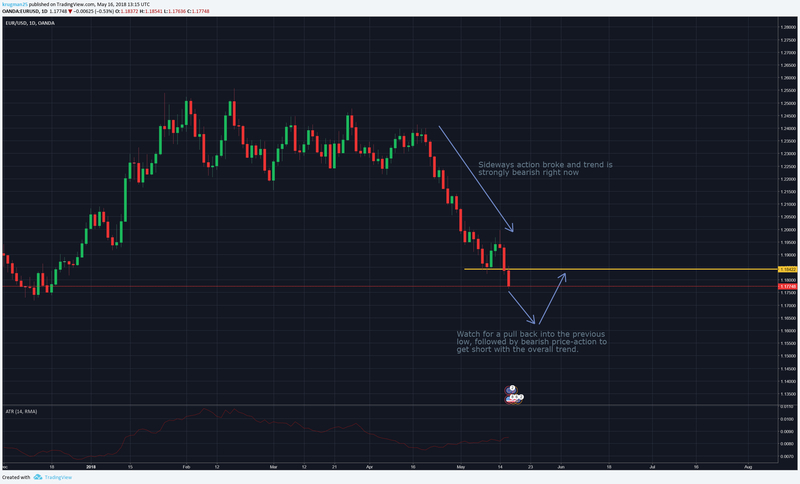 AUDUSD has been showing a lot of weakness and making the bullish reversal setup look less and less likely, but overnight some interesting bullish price action behavior began forming on the hourly time frames. I will be posting about all of that and more later this morning. I posted a trade setup yesterday where a very large bullish pin bar candlestick had formed on the weekly charts that coincided with a previous low (which acts as a major support line) as well as an important price level of 0.75. Price continued to creep lower from yesterday morning into yesterday evening. Then last night the bulls showed up and a nice bullish Double Bottom pattern appeared in the hourly’s. 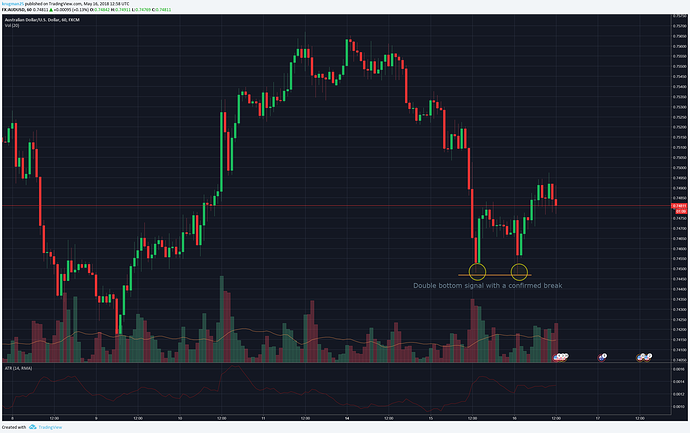 You can view the double bottom on multiple time frames I have chosen the hourly chart here. Reversal setups are always riskier because the reversal must occur into a long term counter trend. That means the force and momentum is tremendous and not easy to flip. Due to that it is not uncommon to see a reversal signal and then watch the markets bounce within that reversal candle range as the market begins shifting. For this reason reversals are most risky than trend-trading but when they do work out the reversal can be quite explosive as many positions are forced to unwind quickly, a.k.a. long/short squeeze. I will be watching this closely to see if the short term momentum can build into long term momentum and we finally get a trend change in this pair. 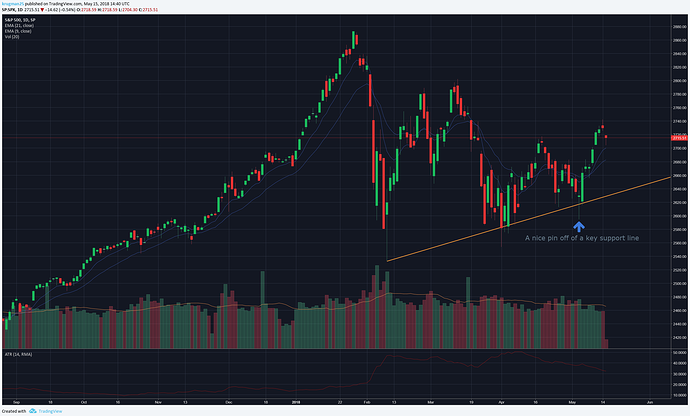 With the market having broken the sideways price action the market is in a strongly bearish trend. These sorts of trends can continue for a very long time. We as prudent traders don’t want to make assumptions on when the trend will end, but rather look for setups to get in line with the overall trend. In the case of the EURUSD -0.55% that is going to involve us waiting for a price pull-back into the last swing low. That last swing low will act as a major resistance line. If price does swing back we will then watch for any sort of bearish candlestick action such as an evening star , pin bar , bearish engulfing bar, etc. Euro / U.S. Dollar (OANDA:EURUSD). Get more trading ideas from krugman25. Follow market experts, get opinions and be heard! Join the largest trading & investing community on the planet. Yesterday I posted a bullish candlestick setup that had formed on the daily chart. 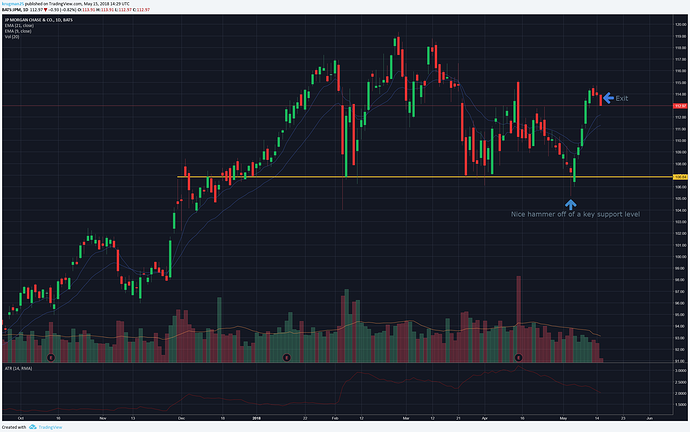 Bullish pin off of a key support trend line w/ increased volume. Earnings were released pre-market and price shot up over 10% in line with our bullish prediction. The next major resistance area is 32.30. 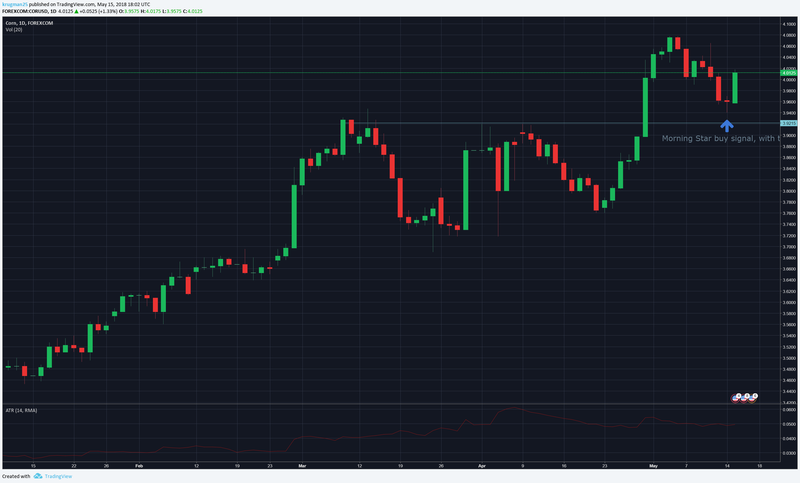 The question now is whether to let it run for further profit on a breakout of 32.30, or take profit on an anticipate pullback from this key resistance level. Silver has reached a key support level . 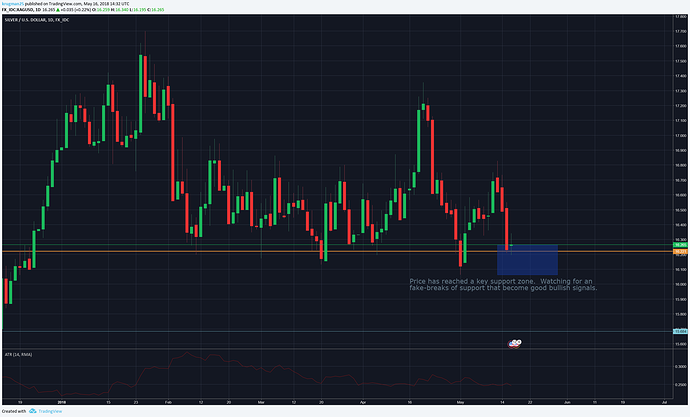 Price action has been range bound for a long time which means we will be looking to trade off of key support/resistance levels. Silver has reached the bottom of it’s sideways range and will absolutely need to hold to prevent a bearish trend . It’s the moment of truth for the bulls. We will be watching for any bullish price action to get long at this level. 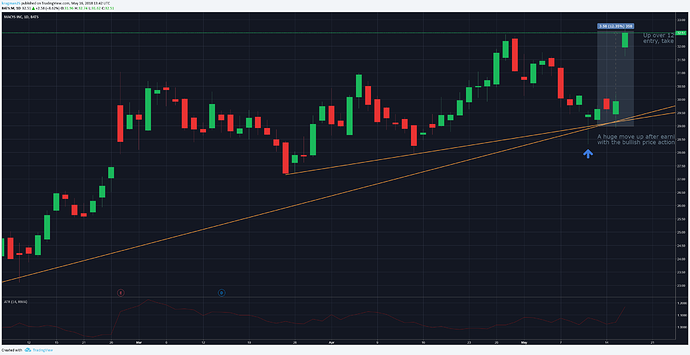 That may come in the form of bullish pinbars, morning star , engulfing bars, etc. Silver / U.S. Dollar (FX_IDC:XAGUSD). Get more trading ideas from krugman25. Follow market experts, get opinions and be heard! Join the largest trading & investing community on the planet. For the Macy’s trade, price action was signaling further strength rather than a pull back so I let the trade run all day and closed 30 minutes before market close. Ended up taking a hefty profit. As predicted in our analysis over the last 2 day, there was a very strong bullish pinbar candlestick off of a key level, and then on the hourly charts there was a very strong bullish double bottom pattern. As I had mentioned, we simply needed a catalyst to push prices up and begin validating these bullish signals. That catalyst has come in the form of critical news announcements out of Australia. We have clearly broken the pennant pattern that I market on the chart and are on track to completing the bullish 1-2-3 reversal pattern. Once that happens, as they say “It’s all over but the cryin”, at least for the bears. 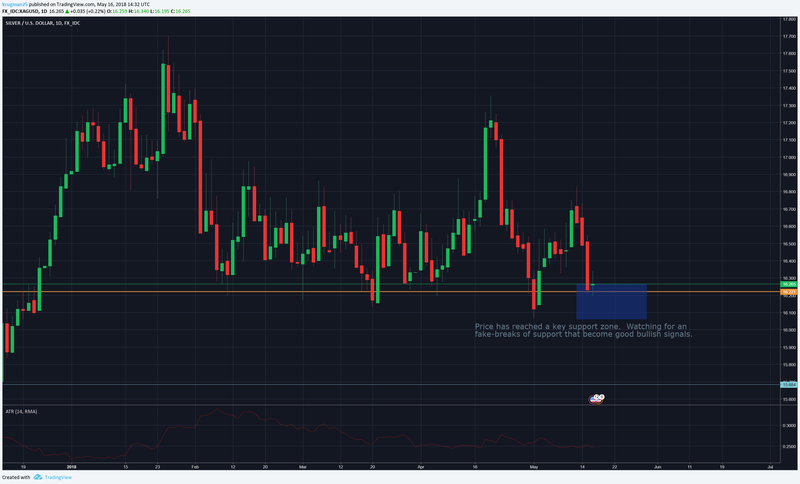 I had already entered the trade at .7490 with a stop loss at .7410 (just below the low of the bullish pin bar candle). Once the 1-2-3 pattern is validated I will then move my stop up to my entry point, essentially make this a risk free trade. Remember though that while these are all very positive bullish developments, nothing is guaranteed. Reversals of long term trends are very difficult to reverse. Stay prudent and defensive while price breaks out or until the patterns are invalidated. No problem jkarmis, thanks for dropping in. This is a setup on the e-mini sp500 futures. Some people may also be able to trade this index through a CFD or ETF. An inside bar has formed on a number of charts including the /ES, /YM, XLF and others. These are all following a strong trend which signals that the market is taking a short breather. Generally in periods of price consolidation after a long move we want to look for opportunities to get in the market on the next up move. In these cases we would be looking to enter the trade on an upside break of the inside bar pattern (2731). A stop loss can be placed at 2700 for an attractive risk/reward setup. S&P 500 E-MINI FUTURES (JUN 2018) (CME_MINI:ESM2018). Get more trading ideas from krugman25. Follow market experts, get opinions and be heard! Join the largest trading & investing community on the planet. Although today’s price action didn’t produce the convincingly bullish strength I was hoping we would see, it is still hanging on there. While on the daily charts there is a bearish pinbar , it has a few things going against it. For one it formed above a support line, which is hardly a bearish sign (and in some cases can actually be bullish ). Also you don’t get the entire picture until you go to the smaller time frame charts. In the 2 hour charts you can see that there was actually a nice quality bullish pin bar that has some good things going for it: it is decently sized, it formed on very large volume , and it formed off of the important 0.382 and 0.5 fibo retracement levels as well as the very important 0.7500 critical price level. I’m certainly not ready to stick a fork in this trade but will be prudently watching and managing my position. Gold has been forming something like a reverse flag pattern where the flag actually points the same direction as the flag pole, or in other words price rapidly fell and the flag is in a descending angle as well. These types of patterns can actually be bullish reversal signals. The flag is descending into a support area and could cause a sharp direction move as price attempts to break out. I would want to enter on a bullish breakout of the flag. Gold Spot / U.S. Dollar (OANDA:XAUUSD). Get more trading ideas from krugman25. Follow market experts, get opinions and be heard! Join the largest trading & investing community on the planet. I didn’t want to leave my cryptocurrency peeps out, so I found a potential setup in Ethereum. This analysis I did as a short video. Enjoy! 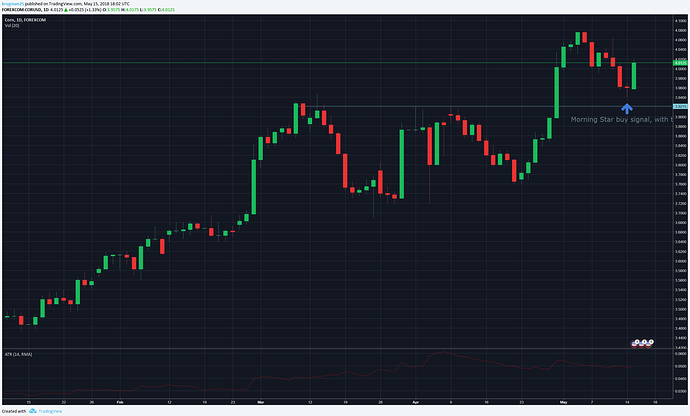 Ethereum 0.24% has been on quite a bullish tear since early April. While price has pulled back and consolidated a bit, the markets could be winding up for it’s next big breakout! There have been 2 fantastic bullish candlestick setups in the past few days. The first is a morning star setup that formed as a large, high quality signal. Price continued to consolidate and then a large bullish pin bar formed. These signals also formed off of a very key support level which strengthens the bullish bias. Overall I think in the crypto space this setup makes a compelling buy. A potential trade would be to enter on an upside break of the morning star or pinbar candles with a stop loss just below the bottom of either. This trade would offer a very attractive risk/reward scenario.